Not all publishers, however, adhere to such a black and white position. The Journal of Graphic Novels and Comics is published by Taylor & Francis. In the ‘Authors Services’ section of their website, the publisher acknowledges that reproducing short extracts of text and other types of material ‘for the purposes of criticism may be possible without formal permission’. To better understand when permission is needed, the publisher directs its authors to the Publishers Association’s Permissions Guidelines. To better understand what rights need to be cleared, authors are directed to the publisher’s own FAQs about using third-party material in an academic article. Thirteen of the publisher’s FAQs expressly relate to the reproduction of visual material, and of those only two concede the possibility of reproducing work without permission (they relate to, respectively, the use of ‘screenshots or grabs of film or video’ and the use of ‘very old paintings’). What is not clear from the FAQs document is whether the publisher is purporting to accurately represent the law in this area. If so – as we shall see – the FAQs document is clearly deficient. If, however, Taylor & Francis is simply using the FAQs document to set out the parameters of its own editorial policy on the reproduction of copyright-protected third-party material, then so be it: the publisher is perfectly entitled to adopt such editorial guidelines as it sees fit. I would suggest, though, that in cleaving to an editorial policy that fails to take full advantage of the scope which the copyright regime allows for the lawful reproduction of copyright-protected material without need for permission, the publisher is missing an opportunity to enable and encourage its contributors to augment and enrich comics scholarship as a discipline. It is in this respect that The Comics Grid is more ambitious and forward-thinking: it actively promotes the lawful use of copyright-protected content for the purposes of academic scholarship. The journal’s copyright policy sets out that third-party images are reproduced on the basis of ‘educational fair use’, with readers and contributors directed to Columbia University Libraries’ Fair Use Checklist for further information. This is a checklist that has been developed to help academics and other scholars make a reasonable and balanced determination about whether their use of copyright-protected work is permissible under s.107 of the US Copyright Act 1976: the fair use provision. Obviously, The Comics Grid locates its copyright advice within the context of US copyright law. But, as a Glasgow-based academic, with an interest in both the history and the current state of the UK copyright regime, my particular focus within this comic concerns the extent to which academics – or indeed anyone interested in writing about comics – can rely upon UK copyright law to reproduce extracts and excerpts from published comics and graphic novels without having to ask the copyright owner for permission. To address that issue we must consider three key questions. What constitutes ‘a work’ protected by copyright within the context of comics publishing? What does it mean to speak of ‘insubstantial copying’ from a copyright-protected comic? And what can be copied lawfully from a comic for the purpose of criticism and review? 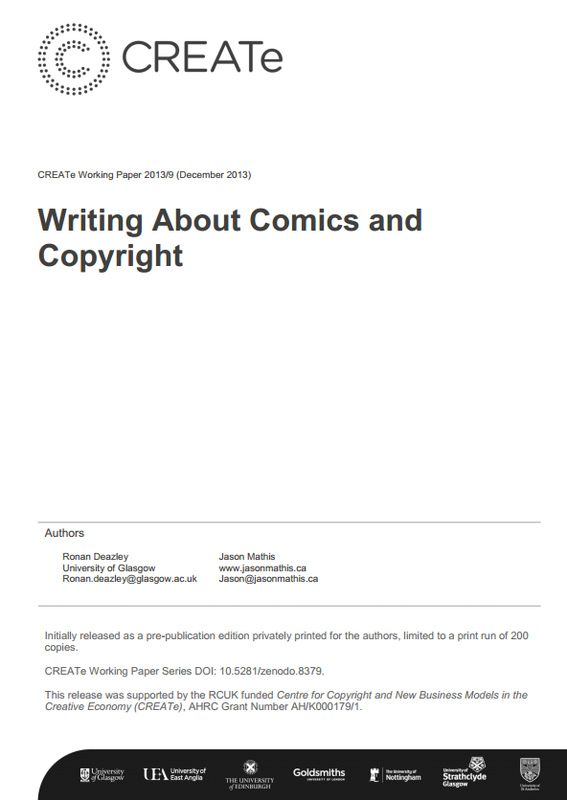 Download Writing About Comics and Copyright.